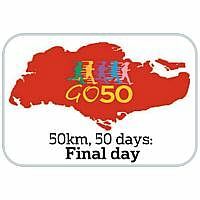 AT AROUND 10.30am today, ultramarathon runners Yong Yuen Cheng and Lim Nghee Huat are due to cross the finish line of a 50km run for the 50th consecutive day in celebration of Singapore's Golden Jubilee. As they do so, they will be grateful to an army of supporters who helped them through rain, shine and injury for the last 50 days. Even strangers who recognised them from the media coverage have encouraged them. "They say, 'Jiayou! (Mandarin for 'keep going') - a few more days to go'," Mr Lim, a 62-year-old editor, said. "It's a small gesture but it really keeps you going." Members of running clubs and representatives from the organisers - youth charity Heartware Network and the Institute of Technical Education - kept them company. And on some days, they received a boost from students who invited them to join school runs. The duo and their pacer Gerrard Lin even inspired amateur runners like Ms Cheryl Ng, 44. She bumped into them at Upper Peirce Reservoir and joined them for 26km that day, then ran 50km with them four days later. "I didn't think I could do it, but the runners paced me and encouraged me," she said. "I pulled through." Friends have given them support, offering prayers and even frog leg porridge recipes. "Our bodies feel very hot from being under the sun so much, so cooling tea from my family members helps," said Mr Yong, a physical education teacher. The pair are helped by a five-member team that wakes up at 5am to stock the supply van with $400 worth of groceries. These include 70kg of ice, 27 litres of water and 10 litres of endurance drinks. The crew follow the runners, stopping every kilometre or so to give them energy drinks or spray water to cool them down. "It's nothing compared to the runners' efforts," said housewife Maureen Setyadi, 36, who volunteered to help. "As long as they have the heart to run, we will support them." Mr Lin, as pacer, has run 50km with them on every day but one. Music blasts from wireless speakers to keep them going. "He tells us when to speed up and slow down so we can last 50 days. It's a great help," said Mr Yong. Mr Lim said: "Singers perform to celebrate SG50, we do what we do best to celebrate Singapore's 50th birthday and inspire others." Last night, the pair prepared for their final leg at Mandarin Orchard hotel. They were due to set off from Ion Orchard mall at 2am.